Does your business or facility need waste or recycling bins for indoor or outdoor use? 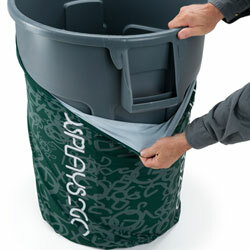 Our commercial trash receptacles offer high quality, affordable pricing, and fast shipping in a huge selection of styles. Models include heavy duty plastic, wood, and metal containers designed for offices, stores, restaurants, hotels, and other public locations. Our professional-quality commercial trash receptacles, including facility waste and recycle bins, come in both indoor and outdoor styles. Many businesses — grocery stores, gas stations, amusement parks, and churches, to name only a few — have public-access parking lots or plazas. Providing commercial trash receptacles encourages customers, patrons, and parishioners to keep garbage, cigarette butts, and other litter off the ground, and makes cleanup easier for custodial and maintenance workers. Similarly, high visibility waste and recycle stations are designed to keep restaurant and cafeteria environments clean and sanitary without being intrusive to patrons' dining experience. What types of facility waste and recycle bins are available for sale? Outdoor garbage containers are designed to withstand the elements while keeping contents safely and hygienically out of the public eye. Easy-empty designs and heavy duty construction are ideal for use everywhere from patios and parks to plazas and parking lots. Restaurant trash receptacles combine attractive wood furniture style cabinets with multi-purpose functionality. Tray tops, modular designs, and combination waste and recycle stations offer convenience to both customers and cleaning crews in food-service and hospitality environments. 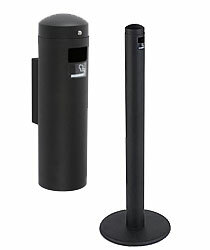 Outdoor ashtrays, smoking posts, and cigarette litter disposal stations are a necessity in public environments. 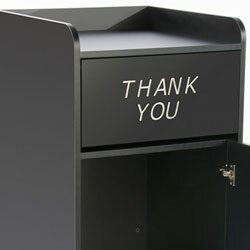 Heavy duty plastic and metal ash trash receptacles encourage smokers to dispose of butts in a tidy and fire-safe way. Elegant stretch barrel covers help turn everyday necessities into stylish marketing fixtures for in-store and promotional event use. These outdoor-rated accessories are ideal for promoting brand information in a subtle way that adds visual consistency to trade shows, fairs, outdoor markets, or sporting events. 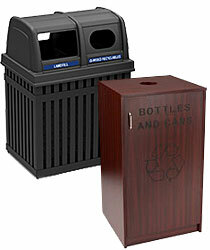 Recycling bins and barrels come in a choice of styles and colors to match any business or operation. 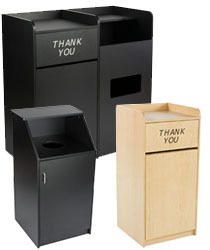 From wood-look cabinets to heavy duty outdoor plastic containers, our recycle stations and fixtures are designed to help office managers and custodial staff maintain sanitary and environmentally friendly public areas. Many of our trash receptacles feature specialty design elements that make store owners' or facility managers' working lives easier. Smoking stations and ashtrays are designed to be fire-safe, sanitary, and easy to clean. 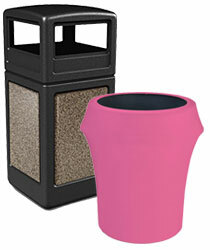 Outdoor-rated garbage cans for public areas offer attractive faux-stone finishes that lend a professional look. Dedicated facility waste and recycle bins come with high-visibility labeling that makes it easy for employees to comply with corporate policies and management plans. 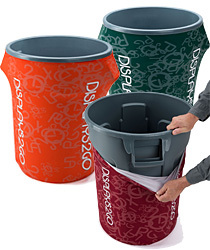 And for operations that conduct business outdoors, whether at promotional events or seasonal operations such as farmers' markets and patio restaurants, nothing beats a custom-printed trashcan cover. These economical accessories turn a necessary eyesore into a branded fixture with passive advertising messaging.